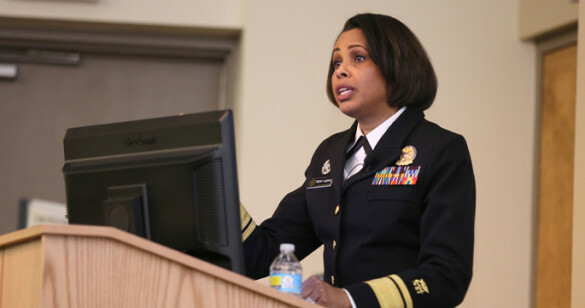 An overflow crowd greeted Rear Admiral Sylvia Trent-Adams, the U.S. Deputy Surgeon General, for her lecture Monday at Vanderbilt University School of Nursing. The nation’s top nurse gave an overview of factors that influence the health policy process and health care delivery system, and discussed the value nurses bring to policy discussions at all levels. Trent-Adams encouraged nurses to get involved in public policy issues and to be bold in making sure the nursing profession has a voice in the nation’s health care discussion. Her talk was the first presentation in the school’s new Dean’s Diversity Lecture series.